Researchers studying a collection of skulls in a Spanish cave identified both Neanderthal-derived features and features associated with more primitive humans in these bones. This "mosaic pattern" supports a theory of Neanderthal evolution that suggests Neanderthals developed their defining features separately, and at different times – not all at once. Having this new data from the Sima de los Huesos site, as the Spanish cave is called, has allowed scientists to better understand hominin evolution during the Middle Pleistocene, a period in which the path of hominin evolution has been controversial. "The Middle Pleistocene was a long period of about half a million years during which hominin evolution didn't proceed through a slow process of change with just one kind of hominin quietly evolving towards the classic Neanderthal," said lead author Juan-Luis Arsuaga, Professor of Paleontology at the Complutense University of Madrid. 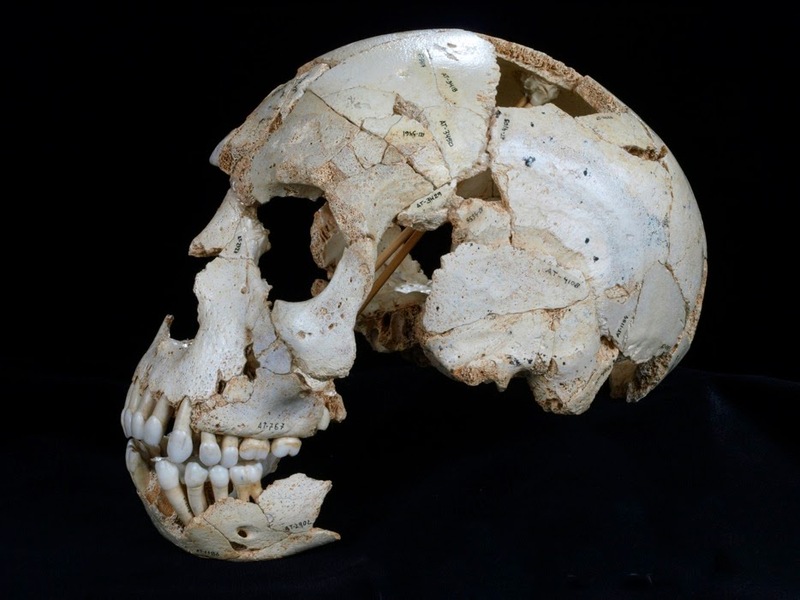 "With the skulls we found," co-author Ignacio Martínez, Professor of Paleontology at the University of Alcalá, added, "it was possible to characterize the cranial morphology of a human population of the European Middle Pleistocene for the first time." About 400 to 500 thousand years ago, in the heart of the Pleistocene, archaic humans split off from other groups of that period living in Africa and East Asia, ultimately settling in Eurasia, where they evolved characteristics that would come to define the Neandertal lineage. Several hundred thousand years after that, modern humans—who had evolved in Africa—settled in Eurasia, too. They interbred with Neanderthals, but even then showed signs of reproductive incompatibility. Because of this, modern humans eventually replaced Neanderthals. The degree of divergence between Neanderthals and modern humans over such a short period of time has surprised scientists. Why did Neanderthals differentiate so quickly from other early hominins? What pattern of changes did Neanderthals undergo? To answer these questions, scientists have needed an accurate picture of European populations around 400,000 years ago, the early stages of the Neandertal lineage. This has been challenging, however, because the European fossil record—an important tool for answering these questions—is isolated and dispersed, consisting of remains from disparate timelines. Samples at the Sima de los Huesos site in Atapuerca, Spain, however, are different. "What makes the Sima de los Huesos site unique," Arsuaga said, "is the extraordinary and unprecedented accumulation of hominin fossils there; nothing quite so big has ever been discovered for any extinct hominin species—including Neanderthals." "This site has been excavated continuously since 1984," Martínez added. "After thirty years, we have recovered nearly 7,000 human fossils corresponding to all skeletal regions of at least 28 individuals. This extraordinary collection includes 17 fragmentary skulls, many of which are very complete." The 17 skulls belong to a single population of a fossil hominin species. Some of have been studied before, but seven are presented anew here, and six are more complete than ever before. With these intact samples at their fingertips, the researchers made progress characterizing defining features. Their work has helped address hypotheses about Neandertal evolution, specifically the accretion model hypothesis, which suggests that Neandertals evolved their defining features at different times, not in a single linear sweep. "For decades the nature of the evolutionary process that gave rise to Neanderthals has been discussed," explained Martínez. 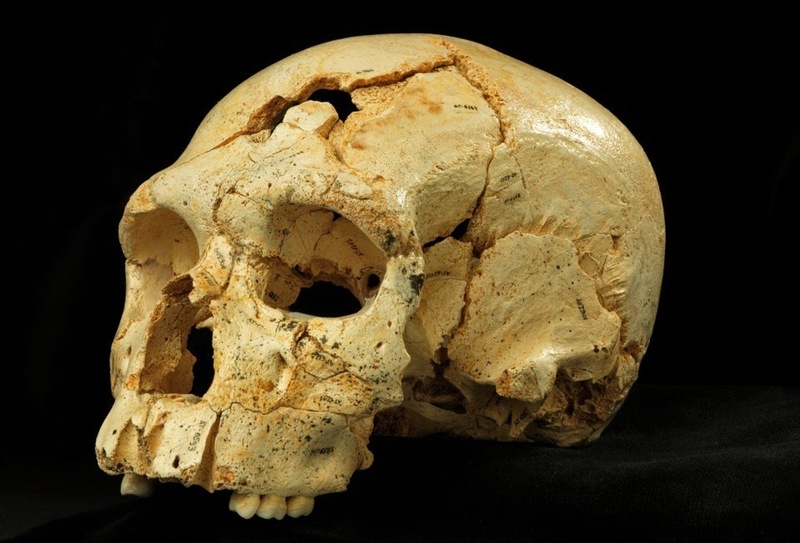 "An important question in these debates was whether the 'neandertalization process' involved all regions of the skull from the beginning, or if, on the contrary, there were various stages in this process that affected different parts of the skull at different times." The researchers' skull samples showed Neanderthal features present in the face and teeth, but not elsewhere; the nearby braincase, for example, still showed features associated with more primitive hominins. "We think based on the morphology that the Sima people were part of the Neanderthal clade," Arsuaga said, "although not necessarily direct ancestors to the classic Neanderthals." They were part of an early European lineage that includes Neanderthals, but is more primitive than the later Pleistocene variety. Critically, many of the Neanderthal-derived features the researchers observed were related to mastication, or chewing. "It seems these modifications had to do with an intensive use of the frontal teeth," Arsuaga said. "The incisors show a great wear as if they had been used as a 'third hand," typical of Neanderthals." The work of Arsuaga et al. 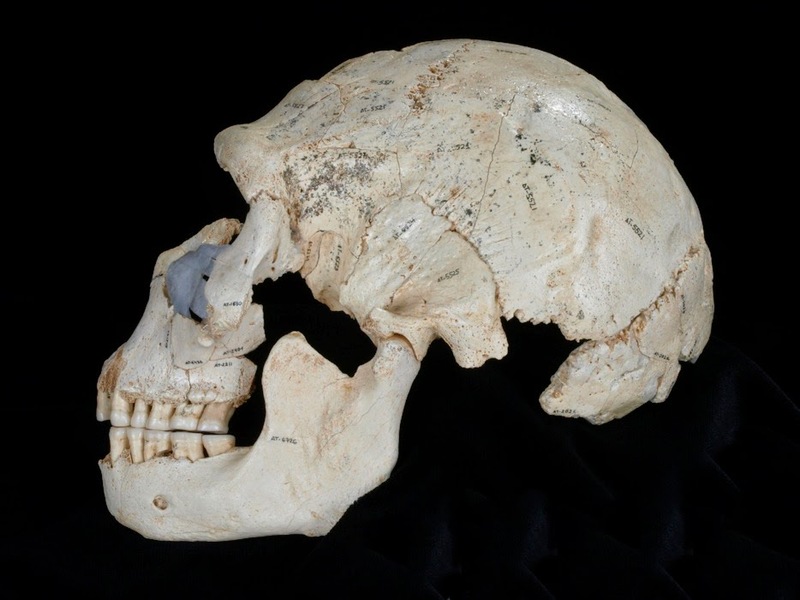 suggests that facial modification was the first step in Neandertal evolution. This mosaic pattern fits the prediction of the accretion model. "One thing that surprised me about the skulls we analyzed," Arsuaga said, "is how similar the different individuals were. The other fossils of the same geological period are different and don´t fit in the Sima pattern. This means that there was a lot of diversity among different populations in the Middle Pleistocene." Indeed, other European Middle Pleistocene Homo sapiens do not exhibit the suite of Neandertal-derived features seen in this fossil group. Thus, more than one evolutionary lineage appears to have coexisted during the European Middle Pleistocene, with that represented by the Sima sample being closer to the Neandertals.